CAN YOU BELIEVE IT HAS BEEN A FULL YEAR! June 1 and 2 is our big anniversary sale. 10% off everything in the store to walk in the door. Chances to win up to 21% off - if you are willing to take a chance! Food, prizes, demos and a ribbon cutting with the Chamber of Commerce! CLASS & OPEN SEW CHANGES!!! May 30th, Just after this Memorial Day Weekend we have added a Serger Class for $35 for any brand of serger. Bring your serger and learn to thread it, set your tension, adjust for rolled hems and other stitches. If you purchased your serger from HHQ, please call the shop to register so we can apply your discount. Please bring your instruction books for reference. Open sew for June was scheduled for 6/27 and we had to move it to 6/18. We will now be having a Judy Niemeyer Sew Day on 6/27. June 9 we are beginning a Embroidery Tiling Scene Class, 4 sessions - Choose your pattern. Second Saturdays June, July, Aug & Nov. We are kitting the Santa's Workshop with the CD and threads for $145. Some are doing the OESD Dashing Through The Snow pattern and we are working to kit it with thread too. June 23 we've added an Embroidery Freestanding Lace class with assembly the afternoon of July 14th. Most of the class will do the OESD Vintage Sewing Machine pattern, but everyone can choose a pattern. Those interested in doing the Christmas Village after this teaching session will offer a follow on set of classes for that collection. July 13 we've added a repeat beginner Ficklesticks class with Bonnie Kastler. Sign up early so I can order the tool kits. July 13 & 14 will be CHRISTMAS IN JULY! All Christmas fabric will be introduced for 2018 and it will be 15% off for the two day revealing. 5/28 - Shop is closed in observance of Memorial Day! God bless our troops and loved ones who have gone before us! 6/11 - Community Service Blocks Due! 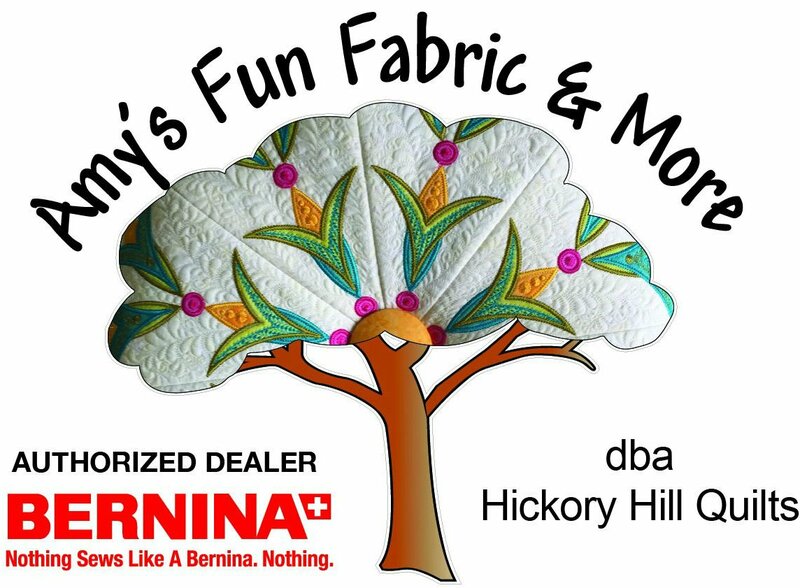 6/18 - Open Sew Day! Burgers! 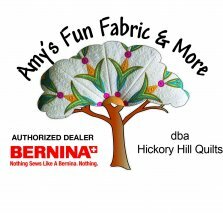 6/20 - 6/22 BERNINA ACADEMY! 6/21 - 8:30 Welcome and refreshments w/ 9:00 am start each day MUST SIGN UP ASAP TO SECURE MACHINES AND KITS! 6/22 - Final Day of class with machine sales to rock bottom pricing for attendees. $200 entry fee returned as store credit with purchase. Keep Checking the Calendar! We are adding more fun classes all the time! Our tentative full year is populated! This is our web page link. Go to the Calendar Header and you will find the calendar month by month. Underneath it on the right is a printer button. It can be printed!